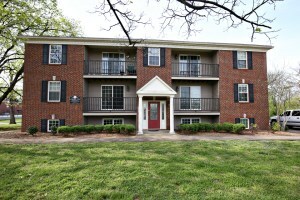 325 W Stephen Foster Ave 302, Bardstown, KY 40004 is an attractive & remodeled two Bedroom one Bath condo in Bardstown! The property sits in the historical district of Bardstown just across from Saint Joseph's Cathedral. The unit permits pets up to thirty-five pounds. There is also great potential to rent the units out. On average units rent between $650 and $700 a month. 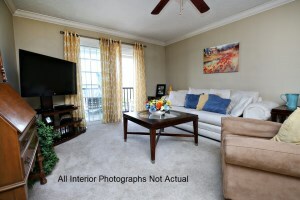 Enter to a spacious Living Room with crown molding which accesses a balcony with custom iron rails. 325 W Stephen Foster Ave 302, Bardstown, KY 40004 has an Eat In Kitchen which showcases Chris's Creations cabinetry, tile flooring, and recessed lighting. There are two good sized Bedrooms. The full bath displays tile flooring & pedestal sink. The Laundry Room completes the floor plan. Please note that the interior photographs of this property are not actual but of a recently sold unit with similar floor plan and interior condition. Call 502-371-1173 for more information about this home for sale in Bardstown. 214 Clydesdale Trace, Louisville, KY 40223 is a gorgeous four bedroom, two and a half bath home in desirable Plainview. Enter to a lovely foyer with glistening hardwood flooring that flows throughout the first level. The Living Room has crown molding. The Eat In Kitchen displays corner desk, dining area, abundant cabinet space, & double sink. The Dining Room showcases board and batton trim work as well as crown molding. The Family Room displays a handsome floor to ceiling fireplace with elevated hearth as well as a wet bar. New owners will love the remodeled Florida Room with sliding glass doors that access the back deck. The first floor also includes a Laundry Room & Half Bath. 214 Clydesdale Trace, Louisville, KY 40223 has a peaceful Master Bedroom highlighted by crown molding with an attached Master Bath. There are also three more Bedrooms as well as a Full Bath. The Basement opens to a spacious Great Room with a large living area, recreation space, & built in bar! The unfinished portion of the basement offers fantastic storage space. The back yard is a luxurious retreat with back deck, in ground pool surrounded by a patio, and full privacy fence. The home also features a 2 car garage. Call 502-371-1173 today to learn more about this wonderful Home For Sale in Louisville, KY.
At Home In Louisville will host an Open House this Sunday September 24th at our beautiful new listing in Plainview! The home offers four bedrooms and two and one half bathrooms. New owners will fall in love with the spacious & tastefully designed interior. Call 502-371-1173 for more information about this Open House in Louisville or visit with us this Sunday! 4016 Midland Ave, Louisville, KY 40220 is a completely renovated three Bedroom two and a half bathroom Cape Cod home for sale in Louisville, KY! The Living Room and Formal Dining Room both have plenty of natural light. The Kitchen is updated with double sink, granite counters, cabinets, new appliances, & dining area. The home features a convenient first level Master Bedroom with a fabulous Master Bath including double vanity & tiled shower. There is also a lovely 1st level Full Bath. The second floor includes two good sized Bedrooms. The Basement opens to a wonderful Family Room and also includes a Half Bath, Laundry, & Storage area. The property displays 9 foot ceilings which creates a spacious feeling as you move throughout the home. Additional updates at 4016 Midland Ave, Louisville, KY 40220 include lighting, windows, new flooring throughout, new central air, plumbing, wiring, & 200 amp panel! The exterior features a new porch & freshly paved driveway as well as a large back yard & 2 car detached garage! Call 502-371-1173 for more information! At Home in Louisville Real Estate Group will host an Open House This Sunday September 17th at our new listing on Midland Ave. You'll love this completely renovated 3 Bedroom 2 1/2 Bath Cape Cod! Call 502-371-1173 for more information about this gorgeous home for sale in Louisville! 9708 Ranger Rd, Louisville, KY 40229 is a beautiful four bedroom one and one half bathroom home in Silver Heights. The property includes a finished basement as well as a two and 1/2 car garage. The sunlit Living Room welcomes guests and is accented by crown molding. 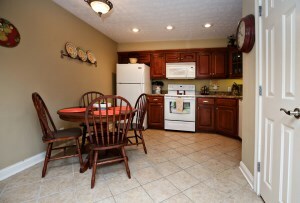 The Eat In Kitchen is good sized with a comfortable dining area that exits to the back deck and crisp white cabinets. The second level includes a Master Bedroom, two additional Bedrooms, & a Full Bathroom. 9708 Ranger Rd, Louisville, KY 40229 has a fully finished basement with a large Family Room and wood burning fireplace. The basement also has a Bedroom which is currently serving as an office & a Half Bath with laundry. The back yard is fully fenced with a sunny deck and 2 1/2 car detached garage. Call 502-371-1173 today for more information about this fantastic Home In Louisville!